The medicine man, or healer of a tribe, carried a medicine bag that contained many different items including herbs for healing. The bag itself was thought to have special supernatural powers. In many tribes, besides the medicine man, every male Indian had a personal medicine bag that carried items that were thought to give them special powers. The items had special significance and were added over the man’s lifetime. You’ll find the instructions for making this American Indian Medicine Bag in the 3rd Grade Projects Gallery in the sidebar. Click the image above for a closeup view. 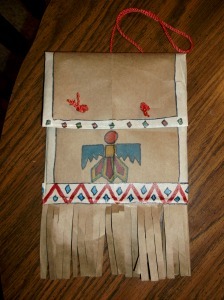 This entry was posted in 3rd Grade, Categories and tagged american indian, american indian medicine bag, american indian medicine pouch, brown paper bag, classroom indian art project, Indian, indian symbols, medicine bag, medicine pouch. Bookmark the permalink.